Janis relaxes with Full Tilt Boogie Band members Ken Pearson (organ) and Brad Campbell (bass) in a Columbus park on a day off between gigs. Full Tilt pianist Richard Bell is standing at rear. 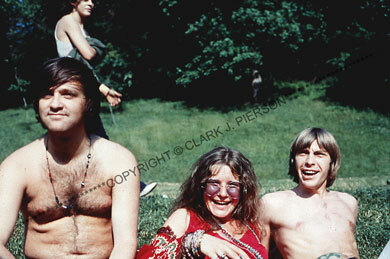 Please note: The use of images of Janis Joplin for commercial purposes is controlled by the Janis Joplin Estate. To inquire about commercial use of Janis's image, please email Kenny Nemes: kenny@jamincla.com. If you are interested in using one or more of Clark Pierson's or John Byrne Cooke's photographs of Janis for a commercial product, please include that information, including image numbers and titles, in your inquiry.